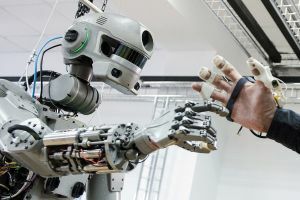 Germany Pledges Not to Use "Killer Robots"
Autonomous weapons are currently at the core of the debate about the future of artificial intelligence, and some countries are already starting to distance themselves from the ethical dilemma and the political controversy involved in their use. In a recent meeting of the United Nations’ Convention on Conventional Weapons (CCW), world leaders have considered a possible ban on these so-called “killer robots” — technically a misnomer, as these autonomous weapons aren’t limited to just the robotic type. Now, at the annual Munich Security Conference (MSC), Germany made it clear they’re not interested in developing autonomous weapon systems. “We have a very clear position. We have no intention of procuring […] autonomous systems,” said Lieutenant General Ludwig Leinhos, head of Germany’s new Cyber and Information Space Command, according to eNCA. However, he made it clear that the German military is not simply choosing not to engage with the issue, but is prepared to defend the country against potential attacks carried out by foreign remote weapons. Germany is the latest nation to officially decry the development and use of autonomous weapons, joining Australia and Canada, as well as the United Kingdom which had declared a ban earlier in 2017. Mary Wareham, a coordinator for the Campaign to Stop Killer Robots, told the panel at MSC that 22 nations already support the ban. Meanwhile, activists all over the world continue to rally against the development of such weapons, which some countries — the United States included — continue to explore. Critics include many of the world’s most prominent experts in AI, who sent an open-letter to the UN calling for a ban on autonomous weapons. Among these is long-time AI researcher Stuart Russell, who once told Futurism that weaponizing AI would bring society more harm than good. Various other groups, including Harvard’s AI Initiative, Amnesty International, and the Campaign to Stop Killer Robots express similar concern. Surely, autonomous weapons occupy only a part of the overall discussion on the future of AI, which most agree is a technological development that should be encouraged and not stymied. Nevertheless, the potential of AI to be co-opted in weapons development is raising alarm in the highest ranks of the world’s security circles.